To subscribe to Lazuli Portals News, please scroll down the page (about half way) in order to trigger our new pop up form ~ thank you! If it does not load for any reason, you can access the form here. We will use the information you provide on this form to be in touch with you - by email only - for the purposes of sharing news about our writing, books, and events, and occasional micro-fiction and poetry. We won't bombard you with emails! 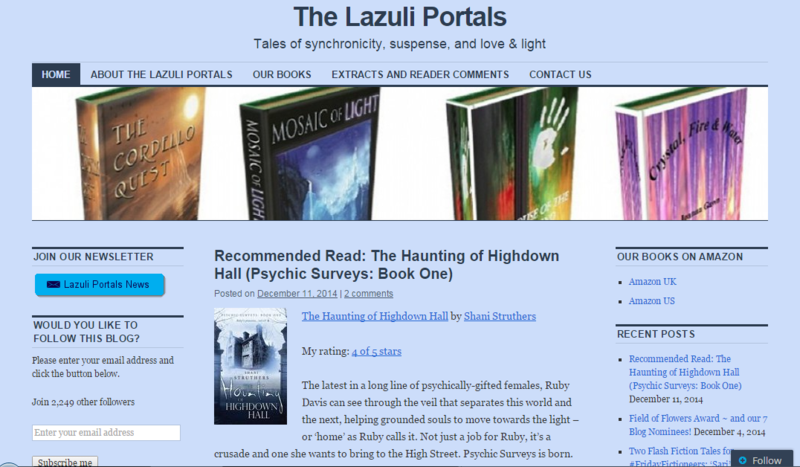 We also have a blog, on which we share micro-fiction and poetry, Recommended Reads, interviews, giveaways, and posts exploring the concepts, characters, and locations featured in the Lazuli Portals Trilogy. We love to hear from our readers so why not visit us and leave us a comment?